NoFraud completely ELIMINATES your risk of fraud. For a low per-transaction fee (starting at just 0.45%), you will be fully protected from fraud chargebacks. You will also eliminate time wasted conducting manual reviews, tricky judgment calls, and "false positives" that result in refunding legitimate orders. 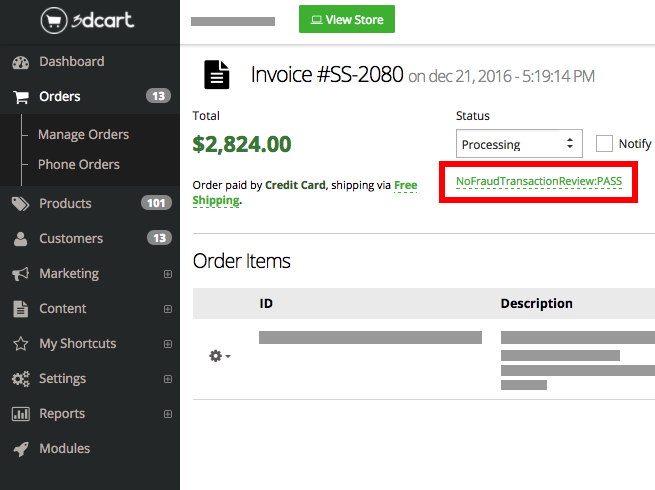 When the NoFraud app is enabled in your 3dcart store, the transaction details for every order are securely and instantaneously sent to NoFraud for analysis and validation. Within seconds, NoFraud provides you with a clear, concise, actionable response right on the 'Edit Order' page in your 3dcart admin panel: PASS or FAIL. There are no scores for you to analyze and try to interpret, nor are you required to configure all kinds of rules and settings. Just a simple PASS or FAIL. No monthly minimums or long-term contracts. Virtually Eliminate Fraud – Our average customer’s fraud rate is below 0.1%. No Manual Reviews – NoFraud provides a simple PASS or FAIL response. Lowest Cost in the Industry – No monthly minimums, monthly fees or contracts. 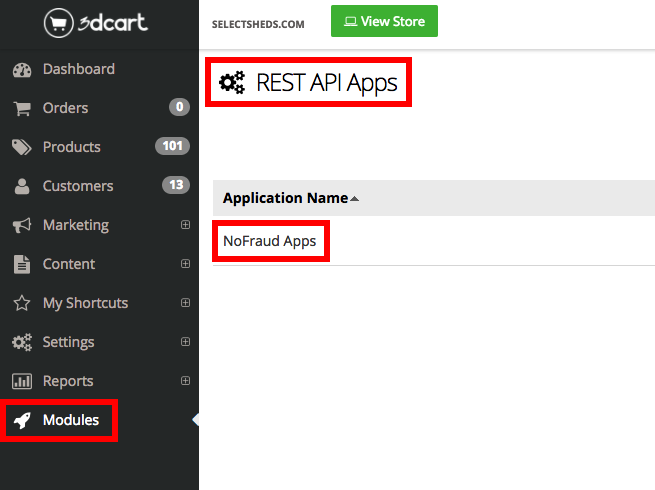 Optional Chargeback Protection – If you get a chargeback, NoFraud will cover it. Completely Eliminate Fraud - If you get a chargeback, NoFraud will cover it. Lowest Cost in the Industry - Low per-transaction fee starting at 0.45%. No monthly minimums, monthly fees or long-term contracts. Simple, clear, and easy to use. I haven't had to use the Chargeback Protection yet - but they NoFraud team has been quick on all of the customer service inquiries I've sent in. Completely satisfied! Excellent. Took maybe 7-8 minutes to integrate and configure the app. And it works beautifully. It's SO nice to not have to worry about fraudulent chargebacks anymore. Great app & a must-have service. Online fraud has become a huge problem in virtually all niches, even one like mine that has historically been pretty much fraud-free. But I've recently gotten a handful of fraud chargebacks and decided I needed a fraud service. I was thrilled to find NoFraud, which doesn't just do a fraud analysis and give you their opinion on whether it's fraudulent or not... they actually give you full-blown fraud protection & reimburse you if they tell you an order passes and then you get a chargeback. It's incredibly affordable too... well worth the peace of mind alone, not to mention the fact that it more than pays for itself in fraud chargebacks I would have had otherwise. The app itself is super easy to integrate. It only took me maybe 10-15 minutes to go through the step by step integration guide (which has screenshots & stuff to make it really easy to follow), and the app has worked flawlessly. This is a great app that has solved a fraud problem I had with prank/malicious orders...I now have full functionality back at a very low, reasonable price! Thanks for providing a great service! I absolutely love the NoFraud service. For whatever reason, I was starting to get an insane amount of fraud attempts and it was becoming super stressful to try to decipher what was legit and what was fraudulent. After a whole lot of wasted time and a couple of costly chargebacks, I went looking for fraud protection. After quite a bit of analysis, I decided to give NoFraud a try. The service has been amazing, and the 3dcart app has worked flawlessly. I love how it gives me a simple PASS or FAIL response. I've been using it for about 10 months now and absolutely love the service. Incredibly affordable, too. I highly recommend both this app and the NoFraud chargeback protection service. This is a solid app, and the No Fraud service is great. It's certainly saved me from dozens of fraud attempts over the past 3-4 months I've been using the service. Well worth every penny! My only complaint (and the reason for the 4 stars instaed of 5) is that I have to log in to the separate No Fraud portal if I want to see the FULL DETAILS about why a particular order passed or failed. That said, it DOES show whether the order passed or failed right there on the order page in the 3dcart admin panel (which is usually all I care to know). And that's the important thing. Can't say enough about the value of this app and of the No Fraud service in general. In the 4 months since we installed it, it's saved us from thousands of dollars in fraud-related chargebacks I don't think we would have caught on our own (fraudsters have become so sophisticated that doing the old-school shipping-vs-billing address analysis and IP address look-up and phone # verification simply aren't good enough anymore). No questions have been answered yet – Be the first to ask! Providing retailers access to the billions of dollars spent online by international consumers with none of the associated risks or difficulties. Order Time features give you unprecedented visibility into every facet of your business, including sales, purchasing, production and warehousing. With ASSURINTYglobal, the merchant captures attractive commissions that are paid upfront.